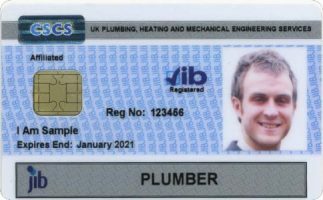 If you are looking to obtain the Blue or Gold (Plumber) JIB card so you can work as a plumbing on constructions sites then you will need to pass the tests. We have create this JIB Plumbing mock test for you to test your knowledge against real exam questions. You will have to take Health and Safety classes and have the experience necessary to work as a plumber on a construction site or other carded area. These questions are based of real live questions you will have to answer in your real JIB exam. More information can be found here. Good luck in your JIB Plumbing practice exam and do not forget to drop a comment below letter us know how you got on. 1. What should you do when using a blowtorch near to flexible pipe lagging? 2. What is the most likely risk of injury when cutting large diameter pipe? 3. You have been handling sheet lead. How is some lead most likely to get into your bloodstream? 4. The legionella bacteria that cause Legionnaires disease are most likely to be found in which of the following? 5. How are legionella bacteria passed on to humans? 6. How should you dismantle a length of cast iron soil pipe at High? 7. Is breaking up a cast iron bath, which of the following is the proper way to protect your hearing? 8. Which of the following items of PPE is designed to protect against infrared radiation damage to the eyes during flame cutting or welding? 9. If you are drilling a hole to receive a pipe from a radiator, when do you need to wear eye protection? 10. What should you do when repairing a burst water main using pipe freezing equipment to isolate the damage section of pipe? 11. You are drilling a 100mm diameter hole for a flue pipe through a brick wall with a large hammer drill. Which combination of personal protective equipment should you be supplied with? 12. When working with fibreglass roof insulation, which of the following items of personal protective equipment should you wear? 13. Where might you come across asbestos? 14. While working, you come across hard, white, powdery material that could be asbestos. What should you do? 15. Why is it important that operatives know the difference between propane and butane equipment? 16. Which of the following statements is true? I thought this was a brilliant test not only did I do the test I also learned too. Being told where I got some answers wrong has now help me learn more . Thank you. Excellent test site, very well set up to help you learn from your mistakes. No one knows everything.